Lush Decor offers beautiful selections of bedding and other decor, and you'll enjoy these quilt sets immensely! Quilts are attractive and easy to care for, and they offer a "down home" look that is warm and inviting in any bedroom of your home. Toss on some decorative pillows or throw blankets to add texture and interest to your bed's design, if you choose, or simply enjoy the quilt alone or with shams. Some people enjoy matching their sheet sets to their bedding. You can do this and leave a corner of the quilt turned down to show off your sheets for a unique and fun look. Quilts are great whether hand made or machine made. No matter how they are made they offer a clean and classic look to your bed. Bohemian or "Boho" decor offers an eclectic look to your bedroom. Some may call it "Hippie Decor" or "Mediterranean Style," but whatever you call it, one thing is for sure, this design style is interesting and fun! 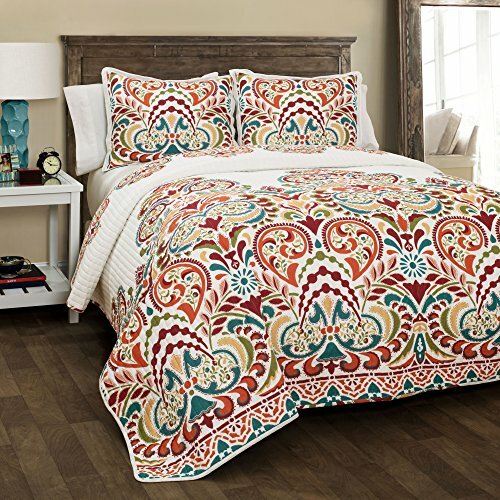 These Bohemian quilt sets will make a beautiful addition to any bed in your home. The classic design of patchwork is great for any gender and any age. These pretty patchwork Lush Decor quilt sets will offer a warm and cozy look to your bedroom. 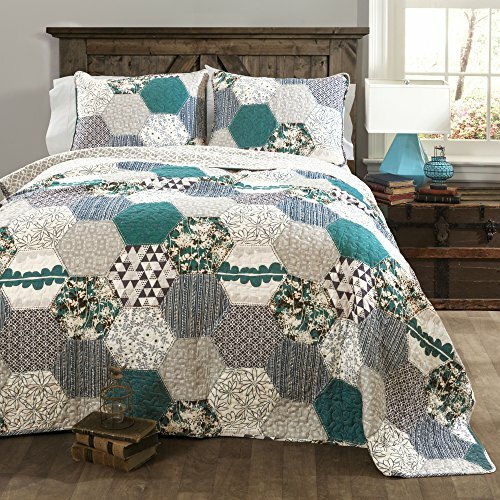 Such a unique Pentagon pattern quilt set. The reverse pattern along with the vermicelli quilting details really bring these quilts to life. The Pentagon shapes features several material patterns. Part of the Bailey collection. Clean and contemporary Lush Decor bedding will add beauty to your bedroom. A thing as simple as changing your bedding set can give your bedroom an entirely new look and feel. Dress your bedroom up with any of these lovely designs. This intricately laid out design explodes with vivacious colors that tingle your senses. Clara is a modern age beauty who also offers an artistic Bohemian flare. Use it with any contemporary or traditional design, too! Nautical design is popular in beach houses, cabins, and anywhere people love the sea. Nautical might include sea life, stripes, lighthouses, and more. 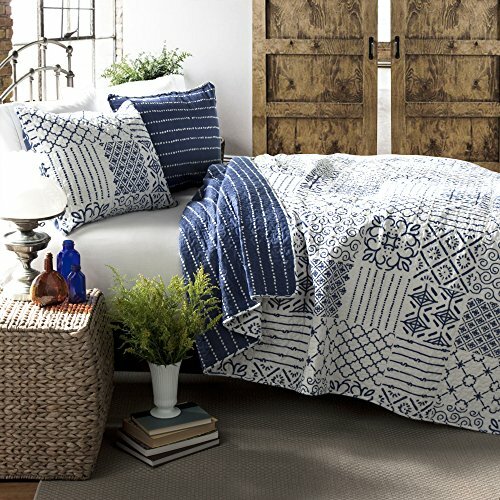 Bring a touch of the ocean into your bedroom with an attractive nautical quilt set by Lush Decor. Classical textured printing using modern stripes, this 6 piece set is made of 100Percent cotton on face fabric. The neutral color tones combined with the comfort that is offered, make this set a must have for every home. 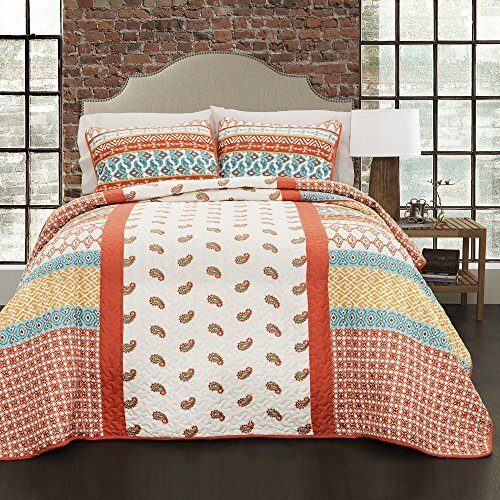 If you enjoy country style design, these these Lush Decor country quilt sets will thrill you! Add some country accessories to your bedroom walls and tables for a down-home look you'll love coming home to. Calliope offers the rare combination of being gorgeous yet fun. A paisley pattern in the center with a stunning motif of patchwork patterns surrounding each side, the vivid and radiant colors further illuminate the artistry.